Coffee Madeira cake filled with coffee buttercream (14%), topped with coffee icing (14%). Sugar, Wheat Flour (Wheat Flour, Calcium Carbonate, Iron, Niacin, Thiamin), Coffee Icing, Vegetable Margarine, Pasteurised Egg, Butter (Milk), Glucose Syrup, Icing Sugar, Whey Powder (Milk), Pasteurised Egg White, Coffee Extract, Salt, Raising Agents (Disodium Diphosphate, Sodium Bicarbonate), Emulsifier (Mono- and Di-Glycerides of Fatty Acids), Preservative (Potassium Sorbate), Rice Starch, Acidity Regulator (Citric Acid). 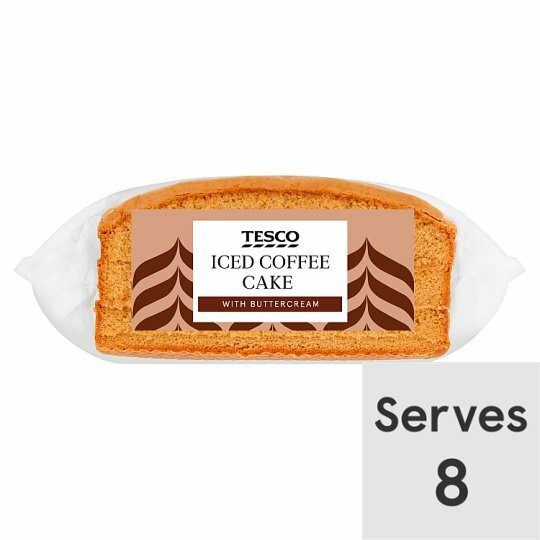 Coffee Icing contains: Icing Sugar, Glucose Syrup, Sugar, Palm Oil, Rapeseed Oil, Coffee Extract, Rice Starch, Emulsifier (Mono- and Di-Glycerides of Fatty Acids), Humectant (Glycerine), Acidity Regulator (Citric Acid). Vegetable Margarine contains: Palm Oil, Rapeseed Oil, Emulsifier (Mono- and Di-Glycerides of Fatty Acids).